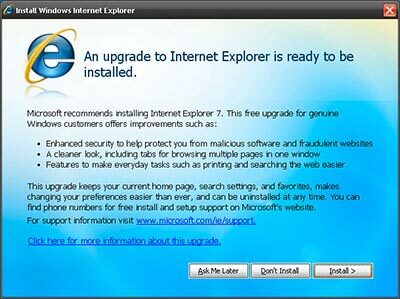 Microsoft Update has started installing the newest Internet Explorer 7. Well, over the weekend I was prompted to install Internet Explorer 7, so it looks like the mass update has begun. 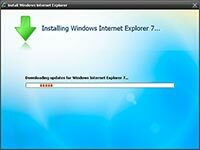 I've been using Internet Explorer 7 since the second beta came out on my development machines to make sure that everything was going to migrate smoothly to the newest Microsoft product. The new installation went as easily as it could have. I've already heard rumblings from the "CSS Webdesign" people that they are excited to "get rid of" IE 6 and only support 7. I'm not as confident. With the number of people that have slow connections, don't have windows update on, and/or have a pirated version of Windows, or just plain said no to the install, I think IE 6 is going to be around for at least another year before IE 7 really picks up speed. Only the stats will tell. As for now, just enjoy the newest RSS feed integration and the smoother, less bulky feel of IE 7.